I went to a predominantly white school. We were all latinxs, sure, but now I know colorism pervades amongst minorities. I didn’t know what colorism was when I lived at home. I learned about it once I moved to the UK at seventeen and I didn’t think I could experience it because I wasn’t black. A couple of years later I realised I could, and I had. I never thought of myself as particularly dark-skinned. I mean, I didn’t ever hide from the sun, and I loved my skin the most when I looked like my dad, when it was ‘ashy like cocoa powder’. I’d looked like that since I was little. I noticed a difference in the way my white friends were treated when they tanned. The way they pulled down their bikinis with pride to show off how many shades darker they’d gone, or how they would ditch the sun-tan lotion because if they burnt their skin the tan would last longer. The concept of fake tanning only revealed itself to me once I moved to the UK from Guatemala, where girls did it so often I started to question when it stopped being a tan and turned into a form of blackface. I lamented the way in which these girls would readily mimic the characteristics that once meant I was called garifuna in such a derogatory way. The girls I’m speaking of weren’t considered to be any less attractive. If anything, their light eyes and blonde hair coupled with their fake skin colour only made them more covetable. 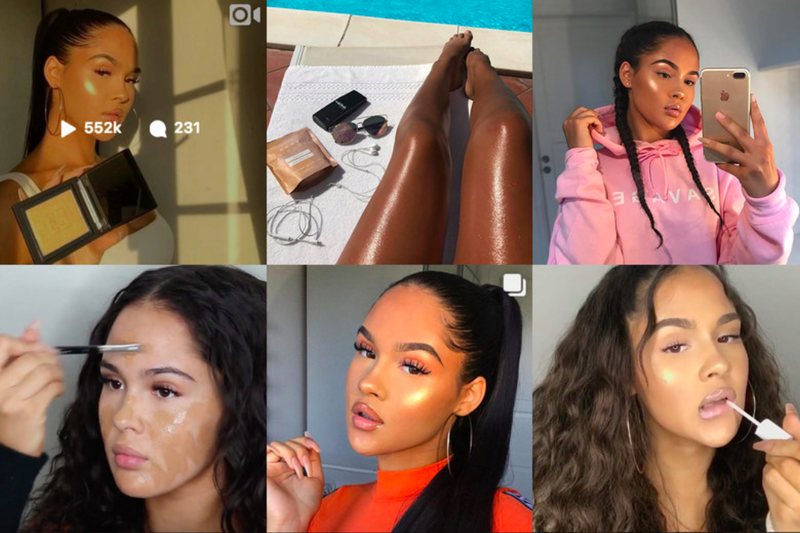 Blackfishing isn’t new - but it’s easier to see now that we have the insurmountable wave of white social influencers that thrive off black and brown culture. But the way the white girls I have known show off their stark tan lines makes me see that - though not to the extent these social media influencers do it - brownness has always been something non-brown people in my social circle both at home and in the UK readily appropriated. After I read an article on blackfishing I started paying attention to the women the beauty brands I follow were reposting. I scrolled all the way down to their first posts, back when they weren’t the brown-skinned women the brands have since favoured. The problem with blackfishing is that it’s an incredibly insidious, yet less obvious form of cultural appropriation; thus, a white woman with a clearly non-white skin colour is a lot less likely to be criticised by her following than if she posted a pictures with dreadlocks or wearing a bindi. The weaves, the endless amount of sponsored posts by fake tan companies, all of this contributes to the idea that when white women do something traditionally brown or black (so traditional that we were bloody born with it) it makes them more attractive. Whereas dark-skinned women, or women like myself who go darker under the sun, are deemed less acceptable because of the way they actually look. This emulation of brownness by white people is offensive, though perhaps not as blatantly offensive as more obvious forms of cultural appropriation, because it becomes yet another thing white women “popularised” even though we’ve literally been sporting our skin colour since the day we were born. My issue with this is that white women aren’t trying to look like tan versions of themselves but like black versions of themselves. They retain their privilege because their caucasian features cannot be entirely erased, no matter how many layers of two hour express darkening foam they try to drown them under. In short, they retain their privilege because they still have the features idolised by Western standards, and ultimately, they will reap the rewards. They won’t get pulled aside by the bouncer to triple check their bag, they won’t get stopped at the border coming back from their holiday, they won’t get told they look too dark or deemed less attractive because they’ve chosen to look darker — all of which people of colour will continue to struggle with on a daily basis. In a world where dark-skinned people continue to seek ways to lighten their skin to fit into the widely accepted societal standard of Caucasian women, it seems preposterous to me that others out there want to seek out the skin colour that so many find hindering. Particularly when I have no doubt these influencers have deemed another woman less attractive because of how dark she is. Blackfishing is just another way white women have chosen to appropriate black and brown features, and it certainly won’t be the last. It made me angry that I couldn’t find an explanation for the frustration I felt when my white friends wanted to look like I did — but only when I wasn’t too dark. Now I have a name for it, and just because it’s easier to swallow than undisguised appropriation, it doesn’t mean that when I come across it in my feed I won’t hesitate to spit it right back out.